The day I see him again we’re in Benevento, a city about fifty miles north-east of Naples. 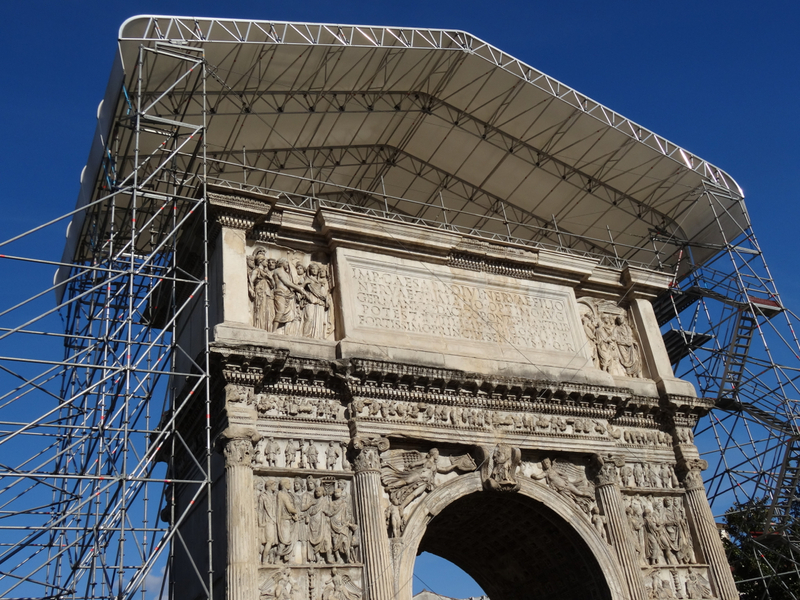 We are in the old city for two reasons: one is to see Trajan’s Arch – built in AD 114 and one of the best-preserved triumphal arches in the world; and the other is to find out more about ‘the Long Beards’ – i longobardi. The horse does not feature in our plans at all. We park beside the city’s huge cathedral – a rebuild following Allied bombing during the Second World War. The car park (or square) is large and empty. We pay a negotiable fee to a man-out-of-nowhere who promises to watch the lonely vehicle, and set off to explore. It’s a beautiful, crisp February day. 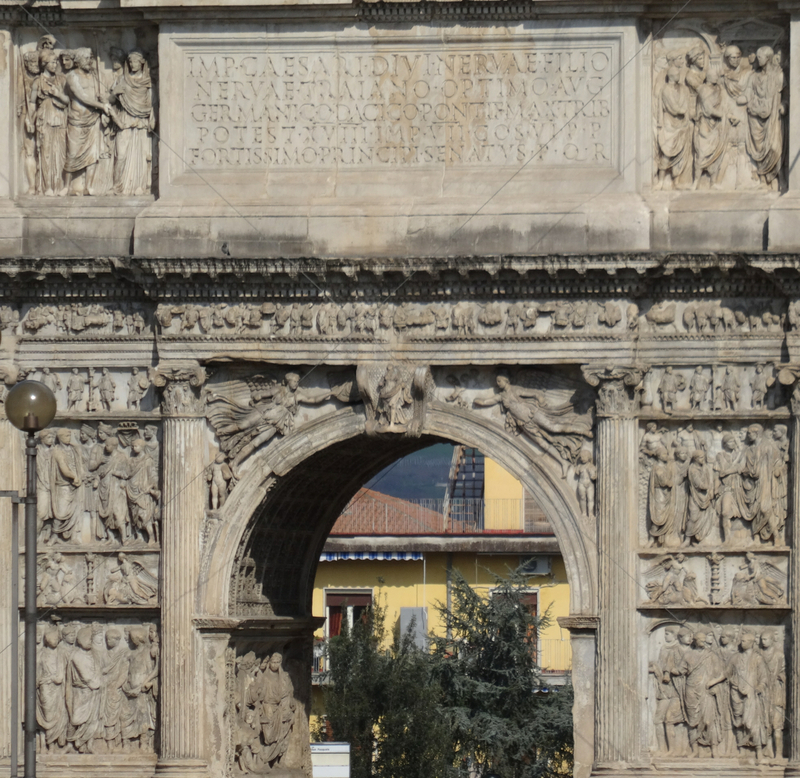 Trajan’s Arch, our first stop, is in a small patch of green, down a slight slope at the end of today’s Via Traiano. The arch is squat, grey, and still handsome, but without a trumpet note of triumph. When we visit a Zimmer frame of scaffolding pokes out to either side, beneath a weatherproof metallic bonnet. The backdrop is modern apartment blocks, and over the fields behind them there’s a glimpse of mountains in the distance. The arch, an ancient Roman veteran abandoned by his city walls, might be a touch wobbly on his feet but his message is still there. 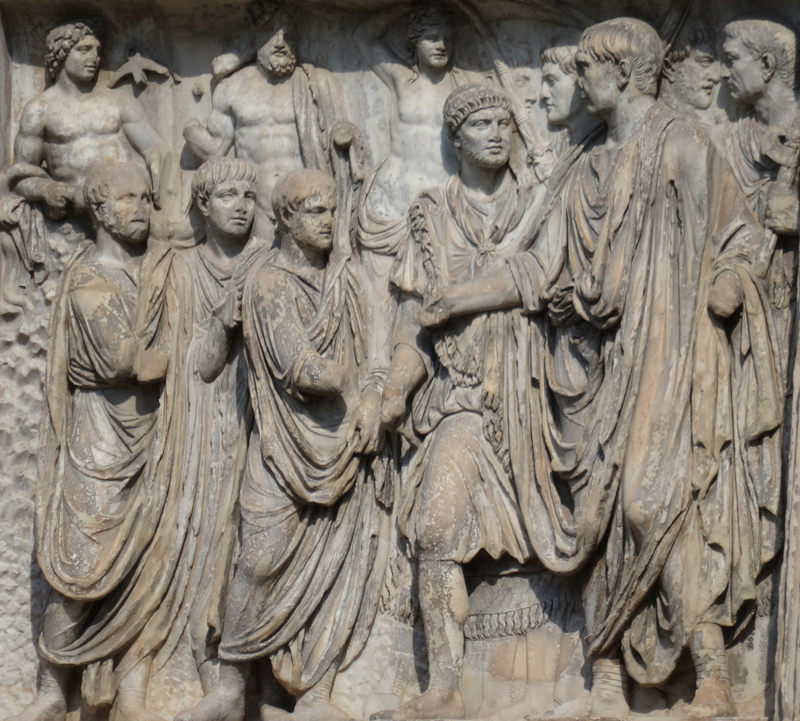 His reliefs, like old medals, tell his story: Trajan, the first non-Italian Roman emperor, was great; and so was his Via Trajana which swept the Appia Via on from Rome through Benevento to Brindisi. 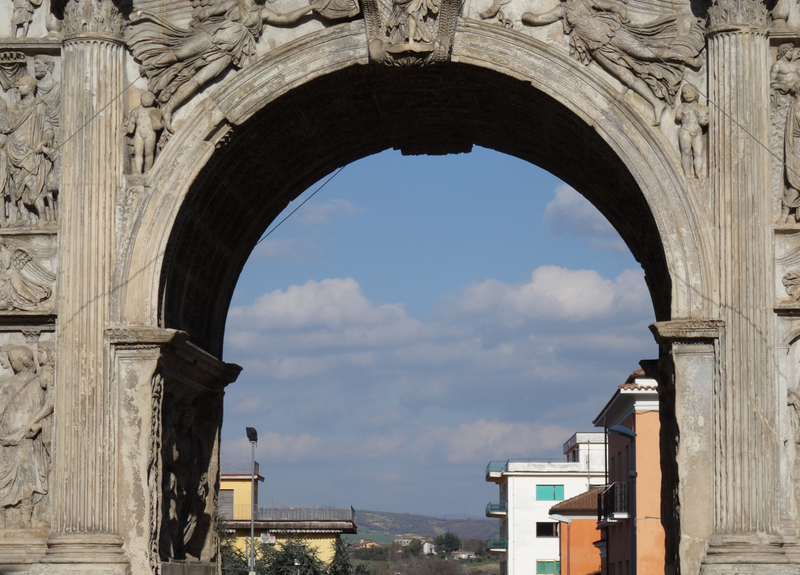 Benevento mattered to Rome, and the arch is witness to that. But Roman influence does not last forever. 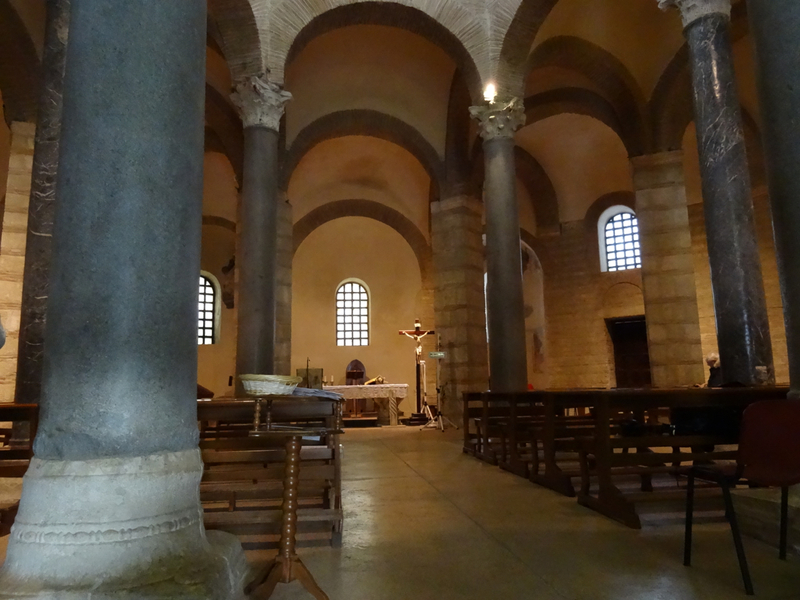 Around the middle of the 6th century, power begins to shift and i longobardi arrive. It seems they come south from Scandinavia, dawdle for a while in north-eastern Europe and Germany, and then, between AD 568 and 774, consolidate their power across parts of Italy, one of the most important being the area that includes Benevento and its neighbours. The Longobards bring with them a mix of cultural influences: Roman, Christian and Byzantine. 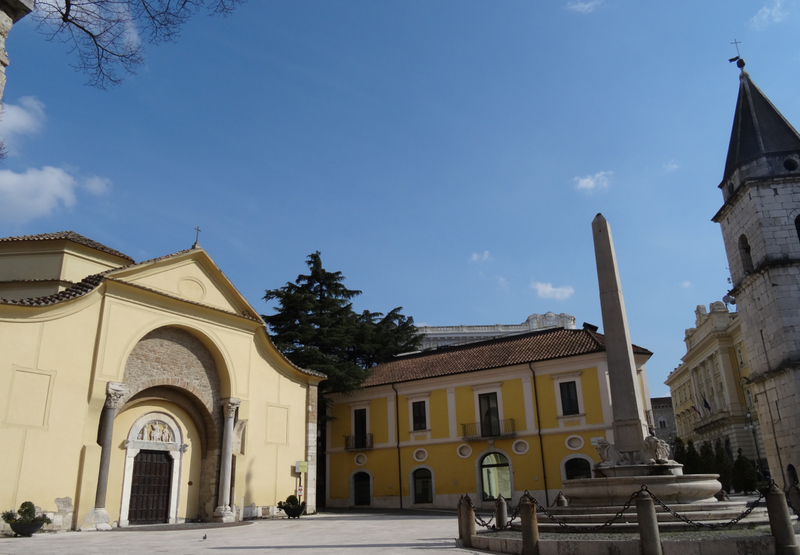 In Benevento one of their best-known thumbprints is the complex of Santa Sofia. This is where we go next. 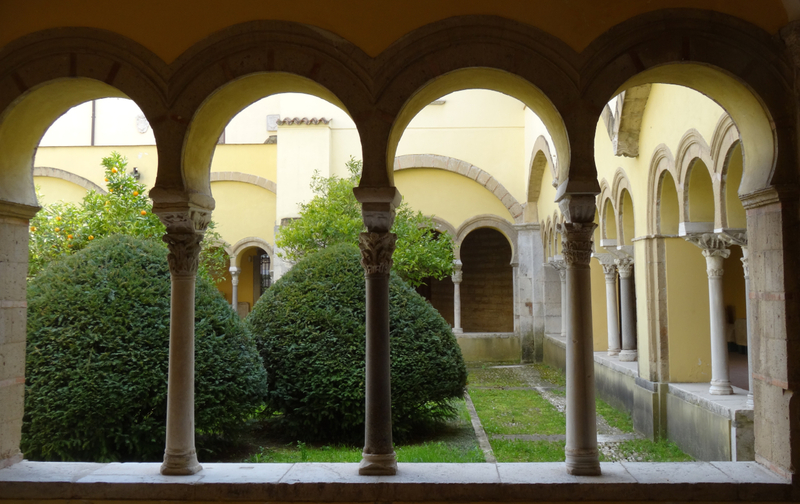 The complex has a petite, elegant cloister and an appealing star-shaped church of vaulted arches and columns. It, and six other Longobard sites in Italy, have caught UNESCO’s eye, but even so there’s hardly a tourist in town when we’re there … in fact we are, clearly, quite a surprise. But what could be better than being the centre of attention in Benevento? We have the wide, paved areas; the mountain views; the renovated history; and all the quirky corners to ourselves. Our final visit of the day, and it’s only by chance, is to a small garden. That’s where we meet the horse. We step through a bright entrance into the Hortus Conclusus (‘enclosed garden’, ‘carefully laid out hidden sanctuary’) … and there he is, high on a wall, golden visor facing out to whatever lies beyond. 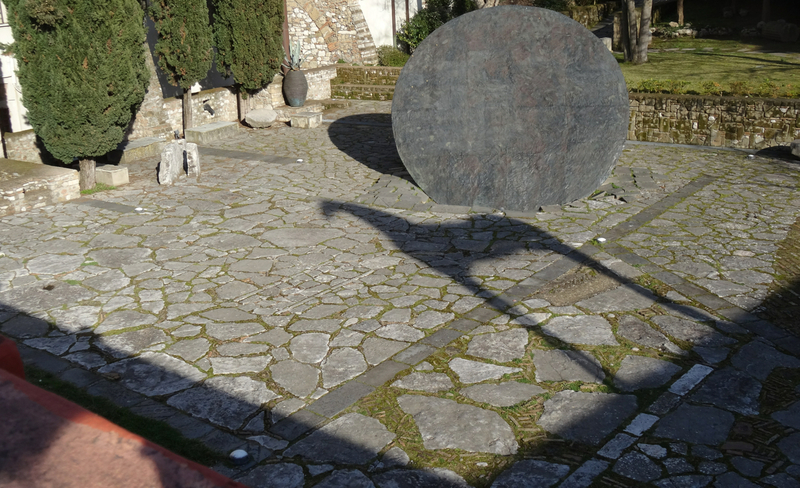 Like everything in the garden, he is the work of the Italian artist Domenico (Mimmo) Paladino. Paladino, born just outside Benevento in 1948, spent much of his childhood in Naples then returned to study at the Liceo Artistico in Benevento. 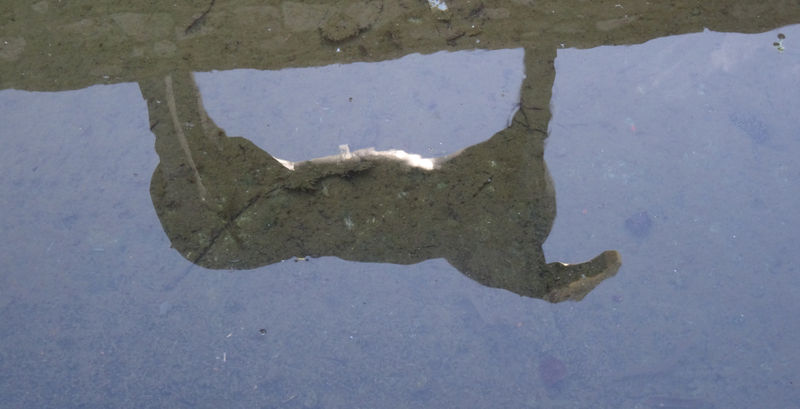 His garden – for a city built on top of empires, and full of shadows and spiritual shifts – disrupts thought. 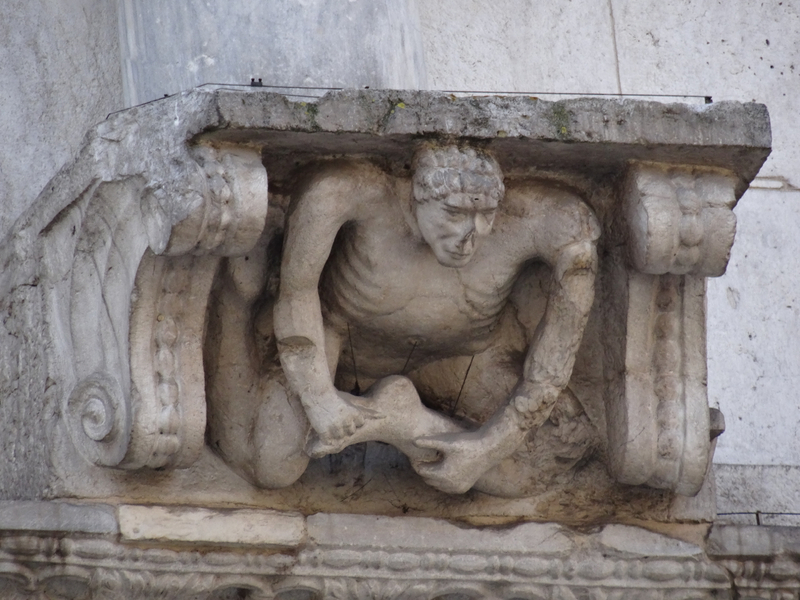 It leaves you free to feel as your eyes wander over and around his long-armed figures, his up-turned umbrella of tiny faces, his symbols, his patterns, the careful tumble of old stone. 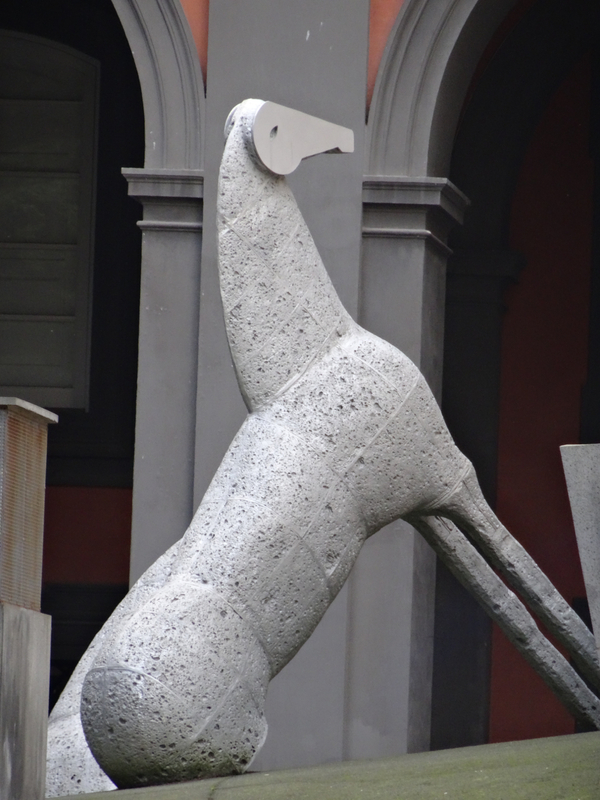 Detail is everywhere but it’s the horse that dominates – like the city it stands in, it’s bold and unafraid. 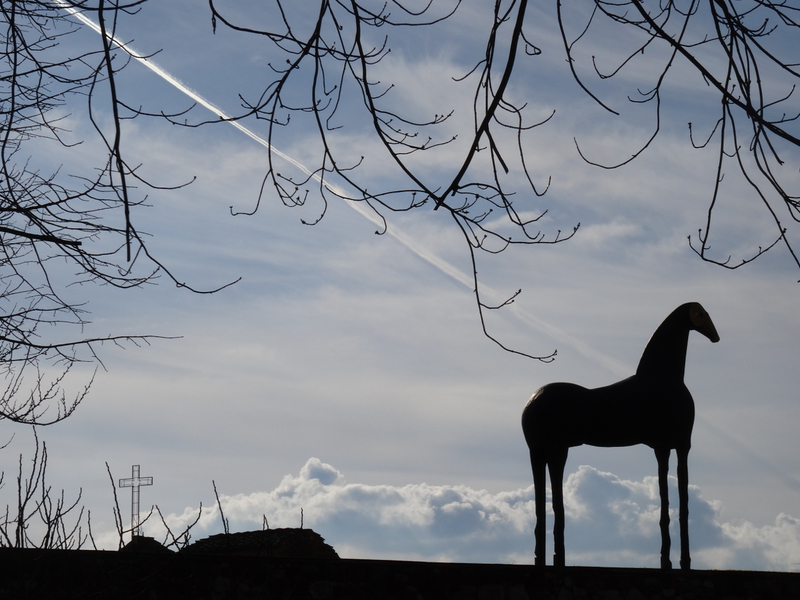 The evening drive home to Naples – the city where I first saw Mimmo Paladino’s horses – was busier than the morning’s … but all we really noticed was the sunset. 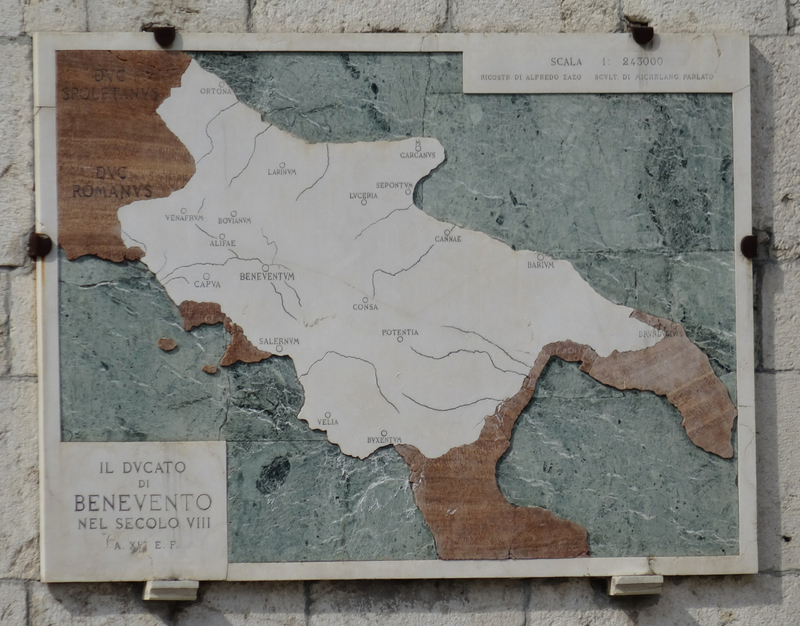 This entry was posted in Benevento, Campania, Italy and tagged Allied bombing, Benevento, Benevento Cathedral, Hortus Conclusus, Mimmo Paladrino, Santa Sofia, the witches of Benevento, Trajan's Arch. Bookmark the permalink. I’m so pleased – thank you for letting me know. I wonder if the old arch is still on his Zimmer frame? 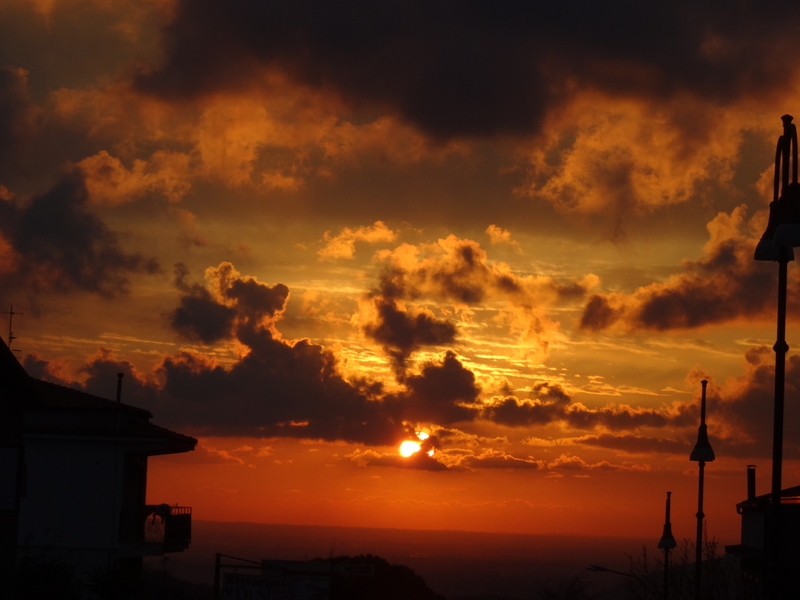 Very enjoyable post, Georgie, and thanks, Suzy, for the bit about the Scandinavian influence in Napoli! 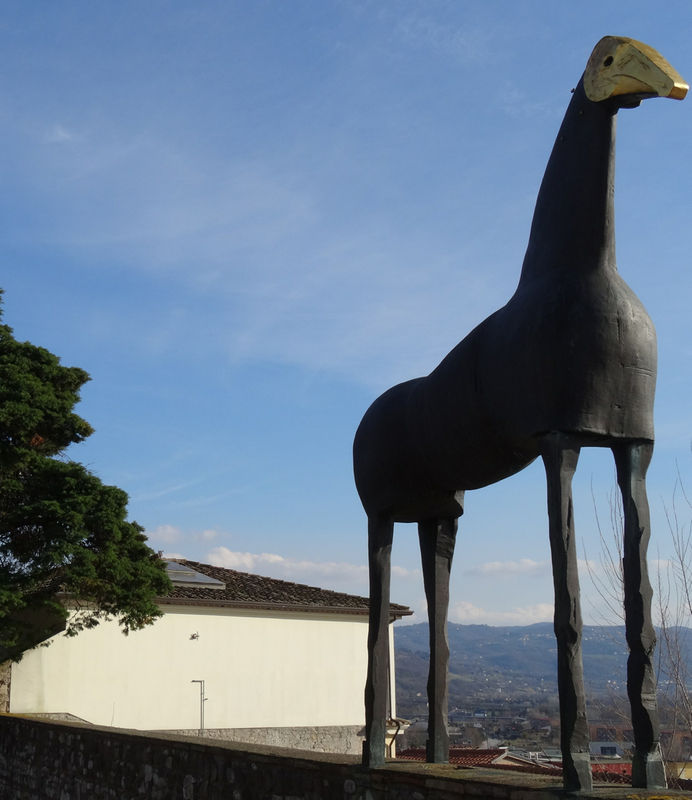 I’ve visited Benevento a few times, but never saw the horse! Thanks Dawn! Suzy’s point about the Scandinavian influence seems obvious now but I hadn’t made the connection until she mentioned it. It’s so helpful to know as for me it’s always the eyes that leave an impression. Thank you also Dawn for giving me a Facebook like – always such a morale boost to get one of those, the same as when someone takes the time to comment … grazie! Hope you get to meet the Benevento horse one day. I really enjoy your posts, Georgie — they give a fresh, new view of this land we love, a welcome treat from yet another Foreign Fan who calls Naples home. Just one point — you erroneously spell the name ‘Paladrino’ a few times (but the horse won’t mind, I’m sure). Thanks for this wonderful post about Benevento. I, too, think it is a special place. I remember having a feeling of deep peace when I visited Santa Sofia…perhaps because of it’s shape…? I found it very comforting and I didn’t want to leave that space. 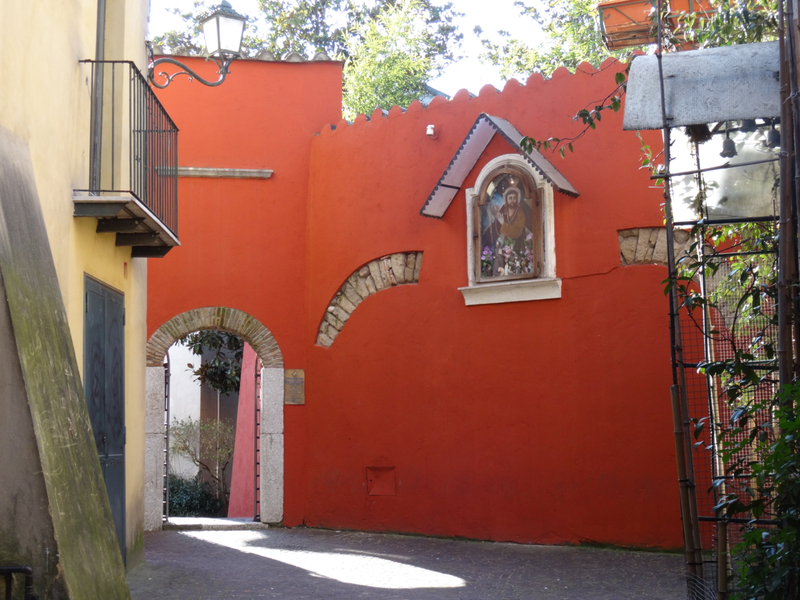 I was also struck when walking the streets in Naples by meeting people with the beautiful “Mediterranean look”– dark hair and skin — but with striking blue eyes. 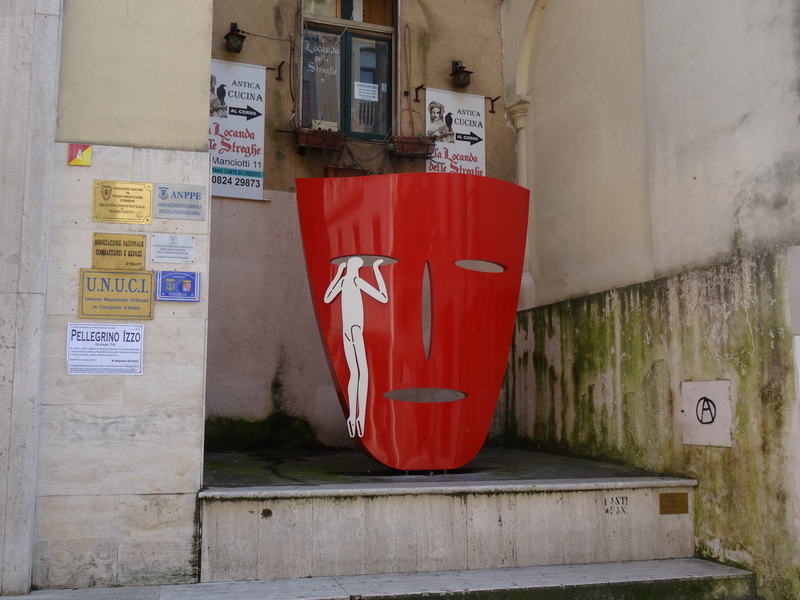 I asked someone about it and was told that many people from the Benevento area have those blue eyes because of the Longobardi occupation mant centuries ago..
Hi – so pleased you’ve discovered and enjoyed Benevento. I think you’re right about the shape of Santa Sofia adding to the feeling of sanctuary – quiet areas but all linked to the whole. Very interesting about the blue eyes – I’m also struck when I find Scandinavian eyes with dark hair. It is amazing how we all link together but have had such different impacts across the world. Thanks so much for taking the time to comment.